Designed by my little brother, Doug. 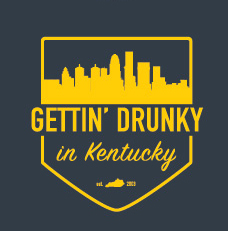 Here’s the first look at this year’s Gettin’ Drunky in Kentucky pub crawl T-shirt. Don’t say I never give you exclusives. Mark it down in your calendar: Saturday, Sept. 9, 7 p.m. at Outlook Inn. Head to Facebook and look up the event so you can hear about the first shirt sales. It’s first come, first serve — and it’s a limited supply.